I am the second owner of this car and bought it for $300 in 1990. It had fortunately been abandoned inside a garage, so rust was not as bad as it could have been. Though there was some minor collision damage to the front and rust along both sills, the car was basically complete and solid and much of the body remains original even now. The dealer emblem on the rear is from the original new car dealer sale. I took on a full rebuild and restoration that took about 3 years to complete. I still consider it a work in progress, as refinements and improvements are always being made. The Hong Kong and China plates are legit and owing to my working there, but just for show in the US. The NJ “QQ” tags are hidden beneath the HK ones. Though never intended as a show car, it is primarily driven for enjoyment, it has consistently garnered 1st and 2nd place in class honors at shows it is entered in. Even after these many years, it continues to be a source of much enjoyment, pride and entertainment. The dealer emblem on the rear is from the original sale to an associates’ son when he was a student in Denver. 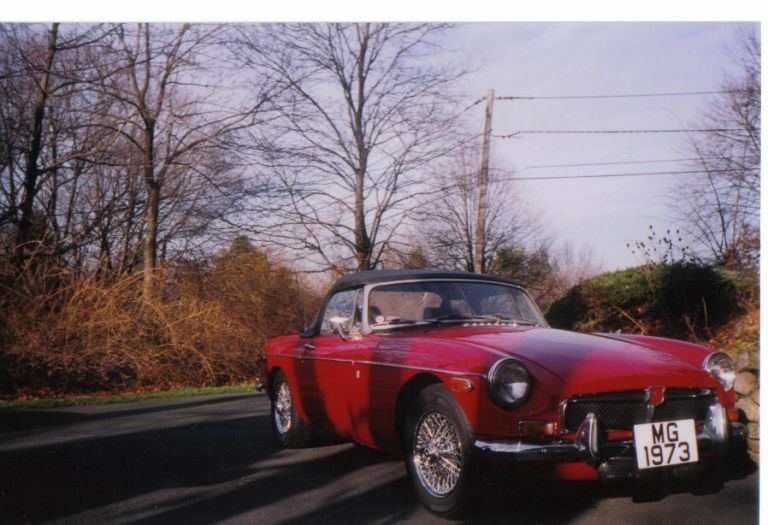 The Hong Kong and China plates are real and owing to my working there and being an active member of the MG Car Club – Hong Kong (the HK club badge is set in the grille), but are just for show and generating interest in a sea of red MGB’s here in the US. The NJ “QQ” tags are hidden beneath the HK ones which are on removable slip plates. The instrument panel and gauges are all original. I used a coverlay on top and sat hours with black silicon and a toothpick to repair cracks in the vertical face which, 18 years on, are still holding up with the repairs invisible. The steering wheel is a Grant Signature Classic. It is not available from any of the MG catalogs, but from most auto parts chains and the JEGS or JC Whitney catalogs. The MG logo horn button is home made from the plain kit piece, but all else is available for all MGB’s. I modified the Stellings & Hellings air cleaners from the HS application by drilling-out the threaded holes in the back plate so they can be fitted to the HIF carbs. I recently changed to a Pertronix electronic ignition and am very happy with the results.